A big 6 gallon capacity. Molded of durable polyethylene. 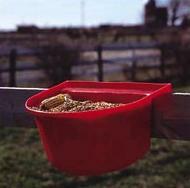 Combine the Super Belmont Feed Tub with a Super Feed-Saver Lip. Same as above in 5 gallon capacity. Designed to fit over stall door or 1" x 6" fence rail. 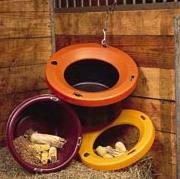 Perfect for outdoor feeding. Will not rust or rot.